Lewis Hamilton admitted that Max Verstappen and Sebastian Vettel's crash at the Chinese Grand Prix gave him his own heart-stopping moment as he feared becoming tangled into the collision. Hamilton avoided contact with either car, but could only finish fourth as his frustrating start to 2018 drags on. Red Bull's soft-tyre strategy after a safety car helped Daniel Ricciardo take victory in Shanghai, but Verstappen had been ahead of his team-mate after pitting, only for two failed overtakes to hinder him. An attempt to go around the outside of Hamilton left him off-track but Verstappen clipped Sebastian Vettel while diving down the inside, sending both into a costly spin, which also landed the Red Bull a 10-second penalty. Hamilton skirted around a three-way collision between Vettel, Verstappen and Kimi Raikkonen in Singapore last year, but feared he would be dragged into the latest contact between the Dutchman and Ferrari star as he drove behind them at the time of the incident. "I was definitely worried of catching them, especially as they were trying to turn around, so I thought I might get caught there," said Hamilton. "But anyway, I got through safely. "I came towards the apex and I saw them both facing me. So I was like, 'I can't do the tighter turn that Kimi had done', so I had to go left." 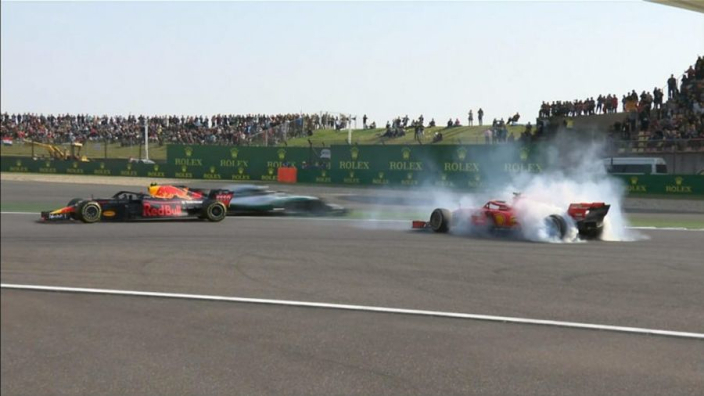 Verstappen had to bail out of a bold move on Hamilton around the outside at the sweeping left-hand turn seven, costing him the track position which could have helped him secure victory. "Turn eight's a little bit more possible [to overtake at], but there's actually a dirty line on the outside of turn seven," said Hamilton of the incident. "It's a very fast, long corner. "I don't think any top driver has ever been taken on the outside there before. "I didn't even see him there, I was doing the corner normally. "When I watch the replay, I don't really understand what he was up to there, but it wasn't a problem for me. "And yeah, naturally [I'm] thankful for the way he drives, because that meant we didn't lose too many points today."